http://www.tawdheef.ae/ is the official website of the leading Recruitment and Career Exhibition in Abu Dhabi which is called as Tawdheef. Last Year more than 100 top companies in UAE had participated in Tawdheef for recruiting Young and talented peoples. This Year lot of companies are already booked their place in Tawdheef. Tawdheef Recruitment Show is going to be held in Abu Dhabi on 29th January 2013 to 31st January 2013 at Abu Dhabi National Exhibition Centre (ADNEC) in Abu Dhabi. 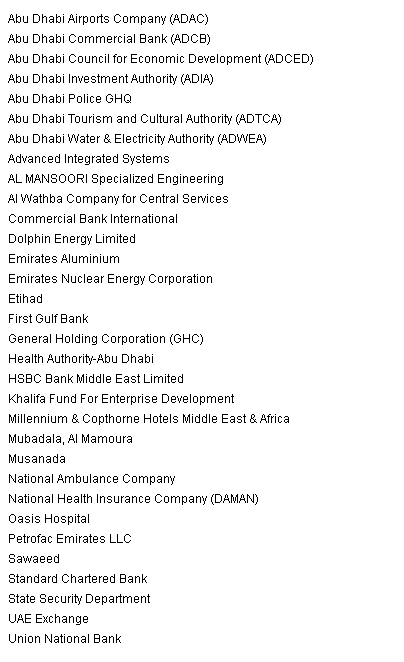 Below listed are the companies already registered for the TAWDHEEF 2013 and more companies will be added to the List. Last year more than 100 companies participated in the TAWDHEEF 2012 recruitment Show. Visitors can per-register in the website through filing the application form . There will be seminar sessions for Emiratis from 31st January 2013 12.30 PM till 1st February 2013 5.30 PM and on 2nd February 2013 from 11.30 AM onwards till 3.00 PM there will be seminar sessions for All other Nationalities. What and all documents should i bring while going for the exhibition. CAN I APPLY FOR MORE THAN ONE COMPANY. THEN IS ENTRY TO THE RECRUITMENT SHOW IS FREE OR NOT. IF WE COULD NOT ATTEND THE EXHIBITION, DUE TO SOME REASON THEN HOW CAN GET ALL SUCH OPENING FOR JOB OPPORTUNITY.